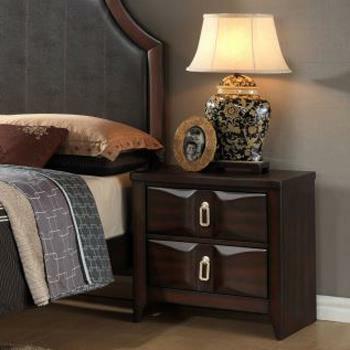 The Charlie Transitional Nightstand with Two Drawers by Lifestyle at Royal Furniture in the Memphis, Nashville, Jackson, Birmingham area. Product availability may vary. Contact us for the most current availability on this product. Sophisticated doesn't have to mean old-fashioned, and the 4157 collection proves it's easy to make a room be modern and chic. Renew your bedroom decor with this sleek and classy bedroom set, characterized by a dusky, two-tone brown wood finish, modern drop pull hardware, and a unique arrangement of convex-carved mouldings. Find the functional storage you've been seeking with the assortment of case pieces, completed by a classic upholstered bed centerpiece with a bonded leather headboard. The Charlie collection is a great option if you are looking for Transitional furniture in the Memphis, Nashville, Jackson, Birmingham area. Browse other items in the Charlie collection from Royal Furniture in the Memphis, Nashville, Jackson, Birmingham area.